Found in 1901, Walgreens is one of the most prevalent pharmacies nationwide with over 8,200 stores across the U.S., the District of Columbia and Puerto Rico. 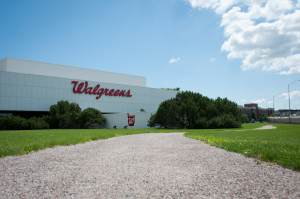 Headquartered in Deerfield, Illinois, Walgreens Corporate is a bustling campus of employees. As of 2009, 5,200 employees funneled in and around the headquarters every day — all of them walking on Kafka’s stabilized pathway mix. In order to endure the intense freeze and thaw cycles of a Midwest winter, the bridge overpass over the St. Croix River was covered with Kafka’s Platinum-colored granite high-friction surfacing. Now thousands of commuters and travelers and cross state lines without worrying about spinning out on an icy bridge. This type of high-friction surfacing aggregate is extremely hard and can endure the abuse of harsh winters and relentless snow plows. Staying stateside, Kafka Granite was able to provide the University of Wisconsin, Madison with a beautiful outdoor softball infield using Burma Red Hilltopper mix. 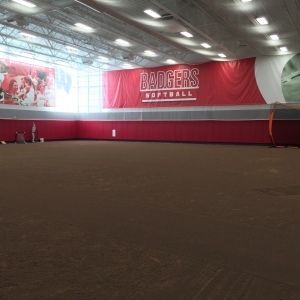 After proving hugely successful with softball-wielding Badgers, Kafka was then asked to install Burma Red Hilltopper infield mix in their state-of-the-art indoor softball field. Located in “Chicago’s front yard,” the Buckingham Memorial Fountain in Grant Park has been pumping water and churning out impressive light shows since 1927. Standing as one of the largest fountains worldwide, more than 20 million people visit the fountain and park annually, making it the second-most visited park landmark in the United States. Kafka Granite provided the eye-catching sunset pink paver grit located around the expansive fountain in Grant Park, complementing the aesthetic beauty of both park and fountain. Aiming to be a “world-class park that is a recreational, environmental and cultural destination,” Brooklyn Bridge Park is 85 acres of renovated post-industrial waterfront in Brooklyn, New York. Construction began in 2008, and the park was roughly 74% complete by the end of 2015. Enjoyed by thousands of park visitors every year for its concessions, volleyball courts, playgrounds and natural habitats, Kafka is proud to have its Salt and Pepper Stabilized Pathway serve as a means to walk through and enjoy the scenery. Gearing up to be the host of the 2017 U.S. Open of the United States Golf Association, Erin Hills is a broad expanse of rolling hills and valleys carved by glaciers. As a cartless, walking-only course, Kafka Granite is using a custom blend wax polymer mix to create walking paths for easier access and maneuverability around the glorious course while being unobtrusive and offering a beautiful natural aesthetic. 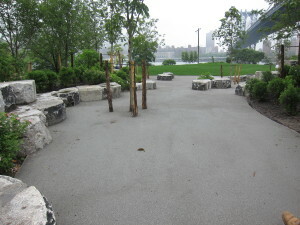 Kafka’s unique recycled copper slag aggregate offers recycled content to precast pavers throughout Chicago’s Navy Pier. As a not-for-profit tourist site, Navy Pier attracts nearly nine million attraction-hungry visitors every year — this ranks it as the top leisure destination in the Midwest. 3. U.S. Capitol Plaza – Washington, D.C.
At the East Capitol Street entrance to the U.S. Capitol building sits the U.S. Capitol Plaza. 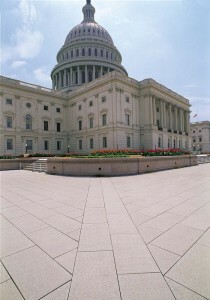 Lined with wrought-iron and bronze light fixtures, benches for taking in the capitol and precisely placed shrubs and trees of many varieties, Capitol Plaza is a place where visitors can take in the essence of the U.S. Capitol. Kafka’s aggregates only add to the natural aesthetic of the area by being used in decorative precast pavers throughout the plaza. Yankee Stadium is home to one of the most well-known baseball teams in history. Having had names like Babe Ruth, Mickey Mantle and Alex Rodriguez on the roster, fans flock to the Bronx to not only watch great baseball, but to also watch a little bit of history. Burma Red Hilltopper mix from Kafka is what such a prominent sports team uses for its warning track around the field and under the cleats of greats. Often referred to as “the heart of the world,” Times Square is one of the busiest and most recognizable intersections worldwide. From being featured in countless movie scenes to serving as home to harrowing Harry Houdini stunts, the crossroads of Broadway and Seventh Avenue gets pounded by the feet of over 300,000 people every day. Wisconsin’s Kafka Granite is featured as an epoxy overlay streetscape and adds vibrant life to the ground to complement the lights in the sky, while offering a non-slip surface for pedestrians. The streetscape color is a custom New York City blend and is comprised of 37.5% recycled porcelain. Kafka Granite is the Midwest’s exclusive distributor of natural thin stone veneer rock panels by Norstone. Kafka is now incredibly excited to be able to offer customers a new offering; Norstone’s undeniably modern and chic new product — the Basalt 3D Panel collection. 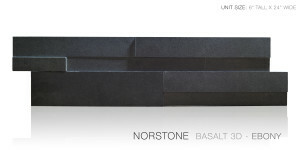 Meticulously crafted by hand, Norstone’s new interlocking basalt panels are hand-assembled to precision. 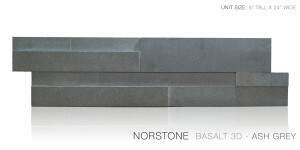 These panels are also the only dimensional basalt panels available in the market: Norstone’s innovations add a three-dimensional facet to any design. Able to be applied in both commercial and residential settings, Basalt 3D Panels complement any modern aesthetic by lending clean lines and modern colors to any project. The interlocking characteristic of these tiles completely eliminates the appearance of vertical seams while rendering them an easy-to-install option. Additional time-saving attributes show up in these panels’ two-part finger-jointed corner system: the need to arduously miter and join corners is nonexistent. Basalt 3D Panels are made of 100% natural stone. Also known as “lava rock,” basalt is an extrusive igneous rock formed by the rapid cooling of basalt lavas at or near the earth’s surface. The hues of grey and black exhibited in these tiles are a result of being untouched for millions of years. Both the Ash Grey and Ebony Basalt color options are purely basalt and purely contemporary. Norstone Basalt 3D Panels add a chic beauty to nearly any area — from residential backsplashes and fireplaces to expansive commercial feature walls or even water displays such as towering fountains and swimming pools. 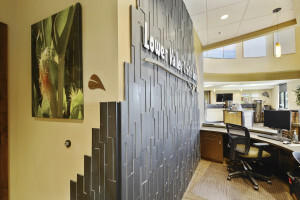 These dimensional panels flawlessly interlock to exacting standards and retain the easy-to-install nature of a veneer panel system. How are these Panels Installed? Basalt 3D Panels are the essence of simplicity from appearance to installation. As an interlocking panel system, Basalt 3D Panels can be installed rapidly over prepared surfaces such as cement board, brick/block, or over a lathe and scratch coat using thinset. Since each panel is precisely crafted to interlock into neighboring panels, there is no need to grout or mortar between individual pieces. However, as a porous stone, Basalt 3D Tiles should be coated with a water-based penetrating sealer. Depending on which sealer is chosen, different levels of sheen can be achieved, creating a truly unique look. Kafka Granite, as the exclusive Midwest distributor of the unique and contemporary design options crafted by Norstone, can show you the vast array of stacked stone and basalt tile panels sure to complement your next project. Timeless yet contemporary, these three-dimensional basalt ledgestone panels could be the perfect addition to your space. To talk about the possibilities, give us a call today.